You’re not allowed to take photos in the tunnel, so here’s a picture of the garden instead. 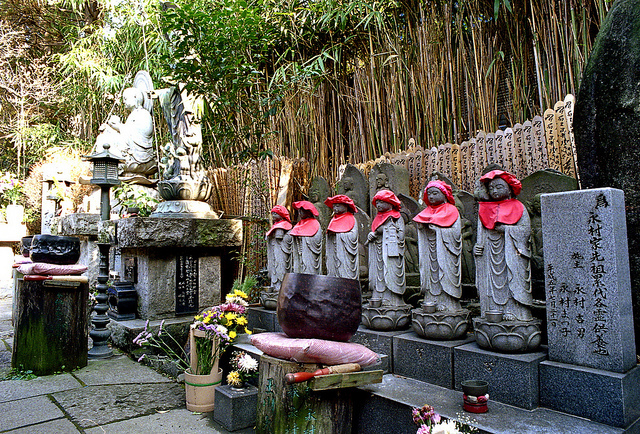 Tamagawa Daishi is an ordinary and unremarkable temple in the suburbs of Tokyo. Ordinary that is, except for the secret that’s hidden underneath. A twisting stone tunnel snakes through the ground below, aiming to provide visitors with a unique spiritual experience, and bring them closer to enlightenment. From the outside the temple looks nothing special. It’s surrounded by houses, and has a pleasant enough garden, with a few Buddhas and some gongs and bells you can ring. But there’s no clue that it’s anything out of the ordinary until you head inside, where there’s a staircase leading downwards. After depositing \100 in a tray at the top, you descend five metres underground, and rapidly find yourself in total darkness. You won’t even be able to see your hand when you hold it in front of your face. Please don’t panic – this is supposed to help you appreciate the divinity of light. Stretch out your hand, and feel your way along. The narrow tunnel makes several twists and turns, before coming to a candlelit chamber full of statues. If you count them, you will find there are 88. They represent the 88 temples on a traditional pilgrimage route around the island of Shikoku. That pilgrimage normally takes several weeks on foot, but here you can do the whole thing in seconds. Beyond this chamber, there’s more darkness and more twists and turns. Then there are giant stone Buddhas, a candlelit corridor containing 300 small Buddhas, each with his own individual demeanour, and another chamber containing 33 statues of Kannon, the goddess of mercy. Finally you’ll reach the exit, where you can ring a bell to signal your completion of the pilgrimage, and emerge once more into daylight. The tunnel was dug in 1934, and stretches for some 100 metres. The experience it provides is, among other things, supposed to represent a journey through the Buddha’s intestines, hence all the bends. It probably won’t feel much like being inside anyone’s alimentary canal to you, but feeling your way along in total darkness is certainly a novel personal experience for most of us. Tamagawa Daishi Temple is ten minute’s walk from Futako-Tamagawa Station on the Tokyo Den-en-Toshi Line, just 14 minute’s from Shibuya Station in central Tokyo. If you’re in Tokyo, it really is well worth a visit, but if you’re in Nagano instead, there’s a similar tunnel there at Zenko-ji Temple.